Stock photo of man and woman dressed in medieval clothing during the medieval markets on the grounds of Burg Ronneburg (Burgmuseum), Ronneburg Castle, Ronneburg, Hessen, Germany, Europe. 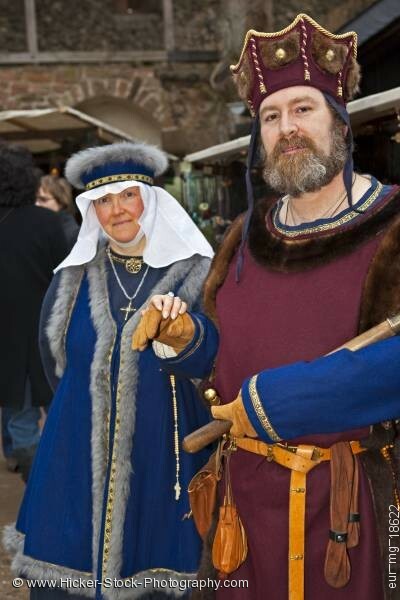 Man and woman dressed in medieval clothing during medieval markets on grounds of Burg Ronneburg. This stock photo shows a man and woman dressed in traditional medieval clothing during the medieval markets on the grounds of Burg Ronneburg (Burgmuseum), Ronneburg Castle, Ronneburg, Hessen, Germany, Europe. A costumed man wears a long maroon tunic trimmed in brown fur. Adding to the costume is a matching hat in maroon with gold trim and fur. He carries a scepter across his arm and in his gloved hand. He holds up his other hand for a woman who is also dressed in the traditional medieval costume. Her tunics are beautiful shades of blue and are also trimmed in gray fur. She wears a blue hat with fur trim, a white headdress and a few pieces of jewelry. Man and woman dressed in medieval clothing during the medieval markets on the grounds of Burg Ronneburg (Burgmuseum), Ronneburg Castle, Ronneburg, Hessen, Germany, Europe.